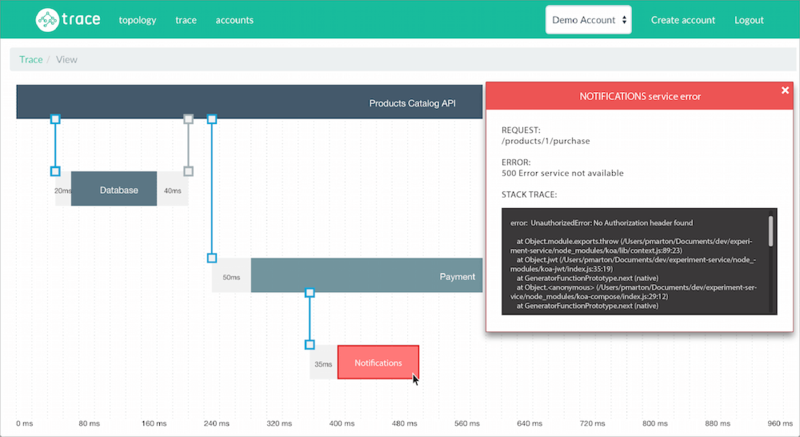 We are happy to announce Trace, a microservice monitoring and debugging tool that empowers you to get all the metrics you need when operating microservices. Trace both comes as a free, open source tool and as a hosted service. Why Trace for microservice monitoring? trace heterogeneous infrastructures with languages like Java, PHP or Ruby (coming soon). We want to monitor the traffic of our microservices. To be able to do this, we have to access each HTTP request-response pairs to get and set information. With wrapping the http core module's request function and the Server.prototype object, we can sniff all the information we need. Trace is mostly based on the Google Dapper white paper - so we implemented the ServerReceive, ServerSend, ClientSend, ClientReceive events for monitoring the lifetime of a request. In the wrapper, we can record every information we want, like timing, the source, the requested path, or even the whole HTTP header for further investigation. 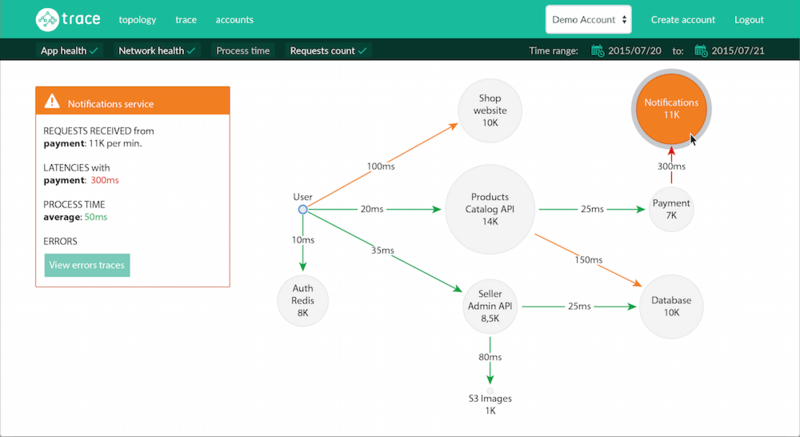 In Trace, one of the fundamental features is tracking the whole transaction in microservice architectures. Luckily we can do it, by setting a request-id header on the outgoing requests. If our service has to call another service before it can send the response to its caller, we have to track this kind of request-response pairs, spans as well. A span always comes from http.request by calling an endpoint. By wrapping the http.request function, we can do the same as in the http.Server.prototype with one minor difference: here we want to pair the corresponding request and response, and assign a span-id to it. However, the request-id will just pass through the span. In order to store the generated request-id, we use Continuation-Local Storage: after a request arrived and we generated the request-id, we store it in CLS, so when we try to call another service we can just get it back. or any other custom reporter (see later). Also, this approach can be really powerful when you want to tunnel these metrics into different systems, like ElasticSearch or just store them on S3. If you want to use the collector with your custom reporter, you have to provide your own implementation of the reporter API. The only required method is a send method with the collected data and a callback as parameters. Currently, Trace supports [email protected], [email protected] and [email protected].